"Shuroge (part of plant)" randomly, and dry. sanding to make flat finish surface. 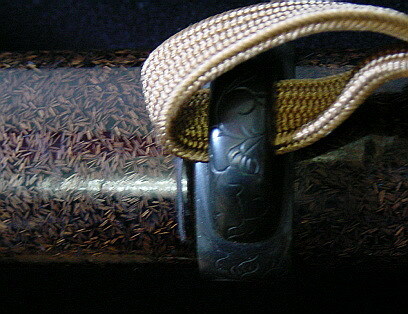 The left Saya is black or Dark brown based "Shuroge Nuri" coating finish. The pattern image will be made by the combination of spreading particles (pattern) and colors. "Momigara (rice shell)" randomly, and dry. Mixed Cashew #53 Transparent-90% and #91 Black-10% is the most commonly use for last Mid layer, to fill up uneven surface. then immediate spread out Gold powder, and dry. 8. Polishing out: Use #400 Sandpaper to make flat evenly. Note: Using Gold powder, called as Kin-Nashiji, and use Silver powder, called as Gin-Nashiji. If changed base layer color, the pattern taste will be changed. The above Saya are black or deep yellow base colored Kin-Nashiji. then immediate spread out Blue seashell particles, and dry. and use #320 Sandpaper to make flat evenly. 9. Finial layer: Cashew #53 Transparent, and buffing. Above Saya is black base layer with abalone shell particles.